How to start with Orioly? Once you create an Activity, you can start receiving bookings. 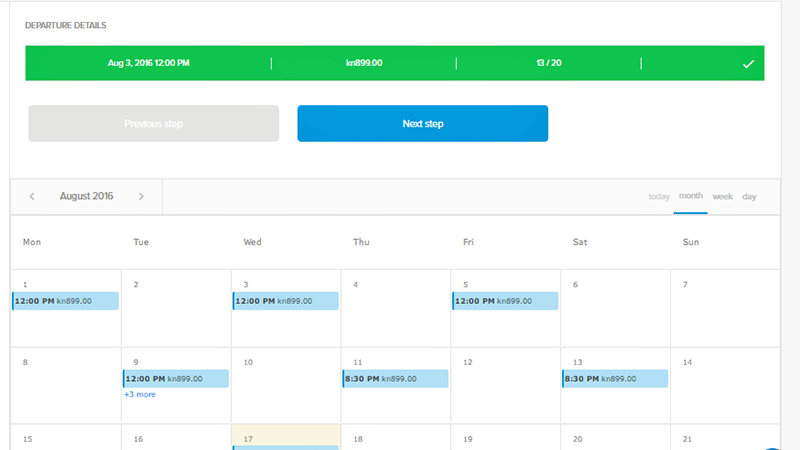 To create a new booking, you need to have at least one activity in your Orioly account. 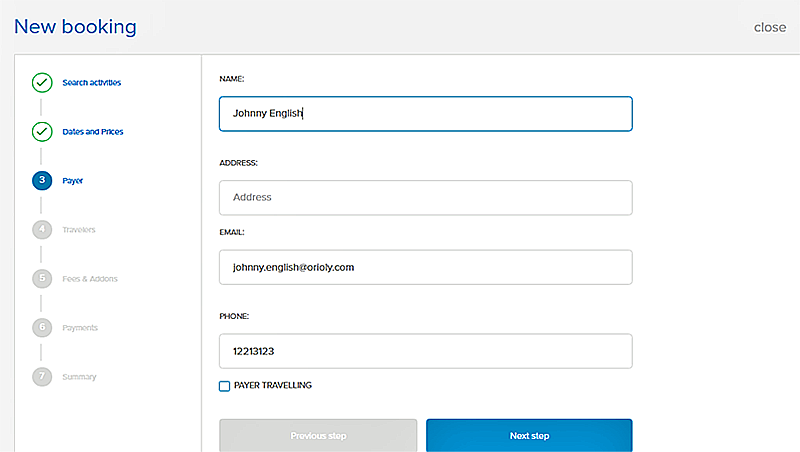 Orioly registers each booking made through the booking button on your website. Each time someone books a tour through your website, you will find it saved in the Bookings section of your Orioly app. Click the Add new button on the bottom left of Orioly app sidebar. Through activities in the Activity section of the sidebar. 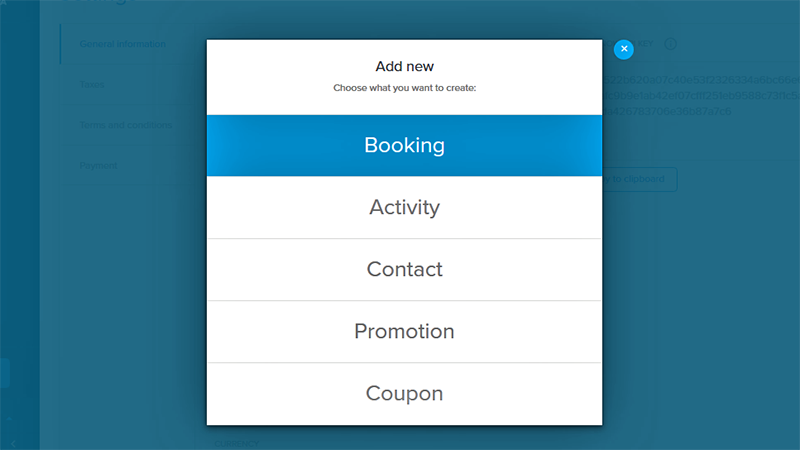 To create your first booking, click Add new in the lower left corner, then click Booking. Complete the following steps such and click Finish to create a new booking. Summary – review the booking. 1. Select the activity you want to book. 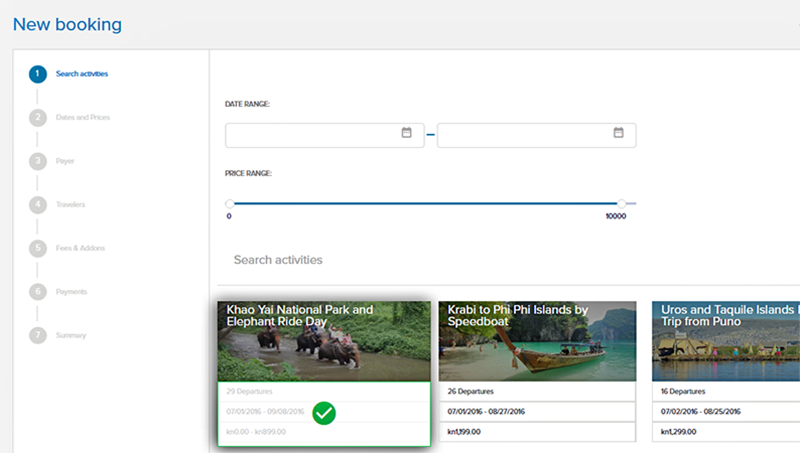 Use the search option to find a specific activity or use the filtering option to filter your activities by the following parameters. First, filter activities by date range. Second, filter activities by price range. Third, enter the activity keyword in the search box. When you find your Activity, click on it and move to the next step. 2. Select a departure from the Calendar of departures. Calendar of departures displays date, time and cost of each departure. Click on the departure you want to book. 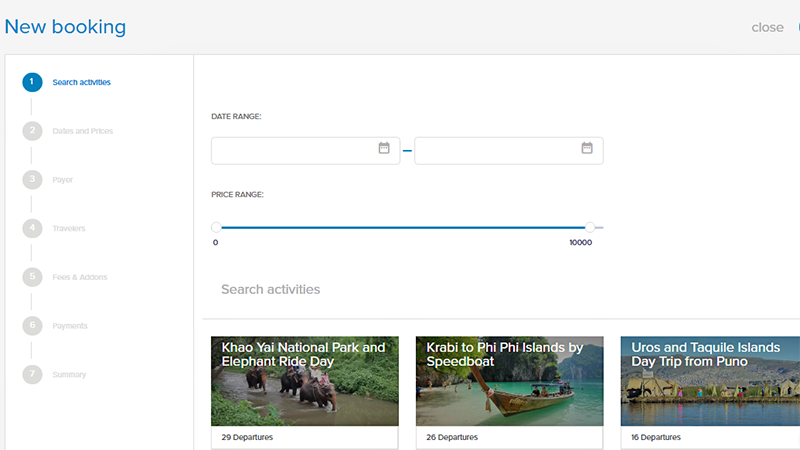 Now you’re able to see the departure details such as date, time, price, and the current booking status. These details show up in the green bar at the top of your screen after you’ve selected your departure. Select another departure, or go back to the previous step and continue with your booking. 3. Enter the information about the customers who will be paying for the tour. A payer is a company or a person who’s paying for the tour. Your customer does not need to be taking your tour or activity themselves. The customer could be paying for someone else to go. For example, a mother could be paying for her son to take a running tour. A traveler is a person joining you on the tour. For example, the son from our example above. Please note: To create a booking and before you proceed to the next step, you must enter the name and email address. If the payer is already in your Orioly system, Orioly will recognize that. Customer information will be pulled out from the contact base as you start typing their name. Check the Payer traveling checkbox in case the payer is also a traveler, i.e. actually taking your tour or activity. This will save you from entering the person’s details twice. In case the payer is not a traveler, add at least one traveler. The process of adding a traveler is described in the next chapter – “Travelers”. 4. Add travelers for this booking. Decide whether you need the traveler’s personal information or not. If you don’t need or have it, check the Details not needed checkbox. Select the number of travelers for this particular booking. 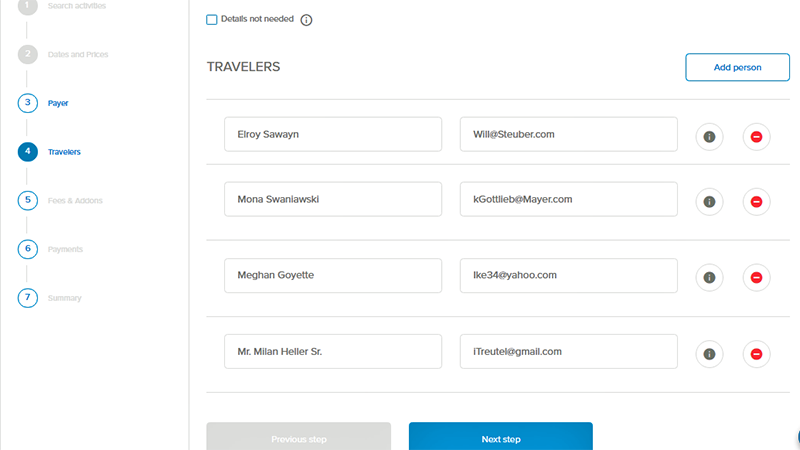 If you don’t need the travelers’ information, leave the checkbox Details not needed blank. Click Add person on the right. Enter the person’s name and email address. If you want to add extra information about these people, click the gray info button next to the email field. Here you can edit the person’s details. 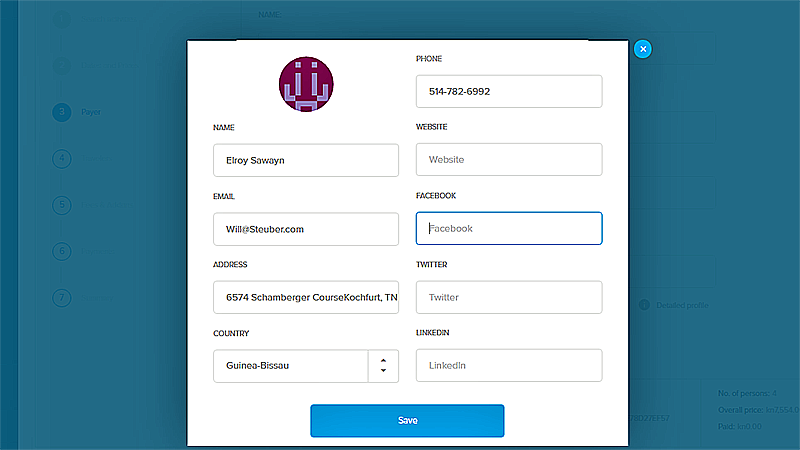 Enter client’s address, country, phone, web address and social media profiles. To delete the person’s contact, click the red minus button next to the gray info button. 5. Check the Enable Children Discount checkbox if want to offer discounts for children. Type in the amount of your discount for children and under Type, choose how you want to express this discount – as a percentage (%) or a fixed amount in the currency you’ve chosen under Settings. Please note: The tour (or activity) price box is editable. 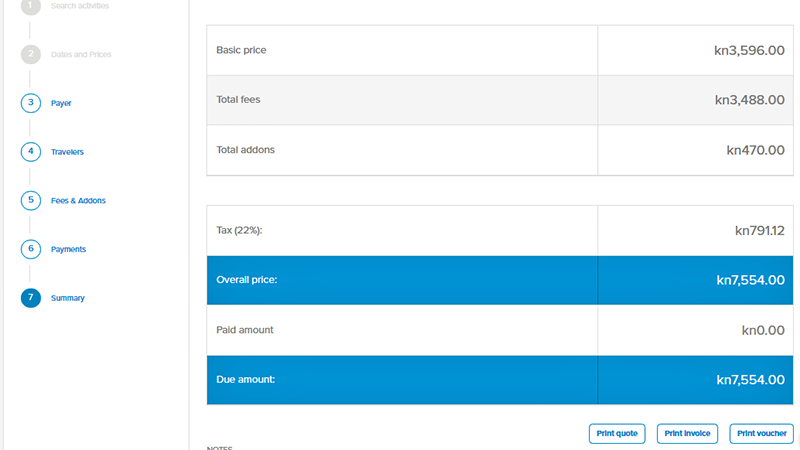 This means that you can edit the default price for each individual booking if you need to. Enter the price for your tour, additional fees, and add-ons. 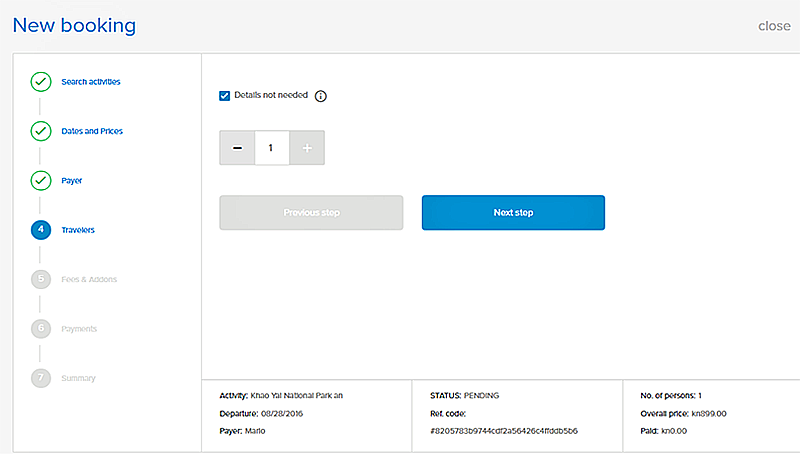 If you already added the price, fees, and add-ons when you create the activity, you can now edit those values. Example: If three travelers are associated with this booking, you can charge for as many fees and/or add-ons as required. Let’s say that one of the travelers wants something extra. And this is not offered through fees and add-ons. In that case, click Add Addons and add the extra add-on for this person only. To delete a fee or an add-on, click the red minus button on its right. You are flexible with adding extra costs to your basic price. 6. 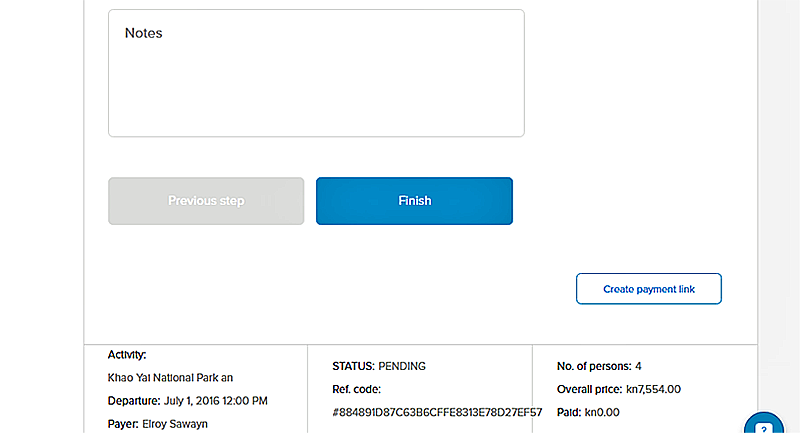 Add a payment, refund or manually change the booking status. Select the payment method. This can be cash or wire transfer. Set the payment date. You can also write some internal notes about the payment for future reference. Please note: For companies operating in Croatia, check the Fiscalize Invoice checkbox if you want to fiscalize your invoice according to the Croatian fiscal standards. Click Add payment to update the total amount paid. Or click Cancel if you don’t these adjustments to be saved. Refunds are typically made in cases when someone cancels their booking. The reason can be bad service, technical issues, change in the person’s schedule, etc. Or maybe you need to compensate a customer. You can create a partial refund, a full refund or just cancel the entire booking. In some typical scenarios, Orioly automatically offers you to make a full refund. Click Add refund and enter the refund amount. To change the Booking status manually, click Set status. Select the new status Canceled, Pending, or Pending. Under the Payment section, you can apply a coupon. 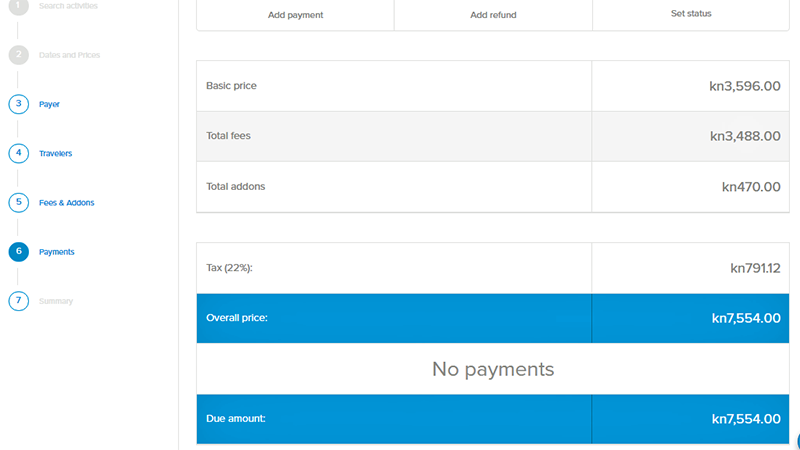 7. Review your booking and decide if you want to print a quote, invoice or a voucher. 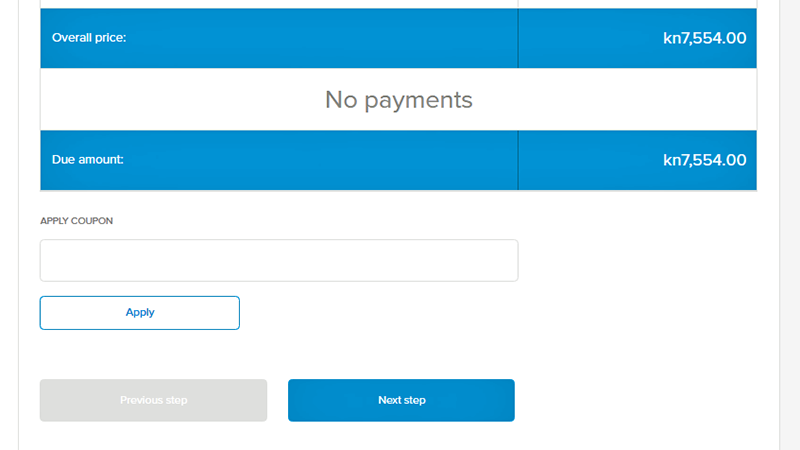 This is a useful functionality when someone wants to make an extra payment. For example, people whose payment status is Pending. Click Create payment link to generate a payment link for your customers. You can send them this link directly via email. Through this link, they can immediately make an online payment. A customer calls your office or sends an email, and wants to make a booking. You enter all the information as described in this tutorial. To avoid waiting for the customer to make the wire transfer or come to your office and pay, create a payment link. Send it to your customer by email. Now they can open it and make an online payment immediately! You have created an Activity with no fixed prices. 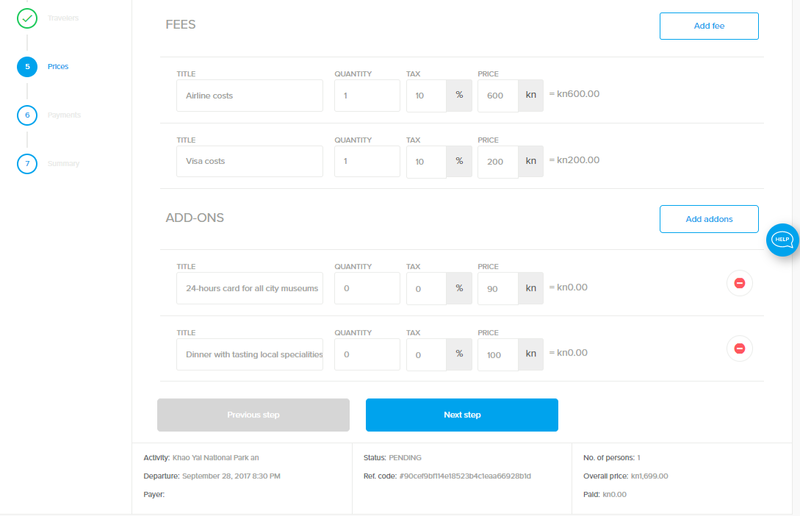 The fee prices are likely to change before the beginning of the activity. In this case, your customer will not be able to make their payment through the booking button. Instead, you’ll get his/her inquiry via email and the new booking will be created in Orioly. Its status will be Pending. Then, navigate to this specific booking, calculate the exact price and send him/her the payment link. Again, the customer can make a quick online payment. The customer has already made a deposit but didn’t pay the full amount. Create a payment link for the rest of the amount and send it to the customer so he/she can make the full payment. Navigate to the Bookings tab on your left to get an overview of your entire booking inventory. Here’s a short video that explains how to manage your bookings.